Over a month after it was initially believed to drop, the first trailer for Spider-Man: Far from Home has landed, and it certainly appears to be worth the wait. The trailer opens with a similar tone to the first movie, featuring the song "I Wanna Be Sedated" by the Ramones as we see Peter Parker going about his day-to-day life, eventually heading to Europe on a summer field trip with his friends. Halfway through the trailer, the tone completely changed, revealing Nick Fury, Mysterio, and a plethora of new villains for Spider-Man to face off against, in addition to two brand new Spider-Man suits. There was so much going on in this trailer for the highly anticipated Spider-Man sequel that it might have been easy to miss some of the smaller details scattered throughout the teaser. With this in mind, here are 5 details you may have missed in the first Spider-Man: Far From Home trailer. The trailer opened up on a banquet fundraiser for a homeless shelter, seemingly hosted by Aunt May with Spider-Man present as a special guest. While the name of the shelter was never actually shown in the trailer, it is more than likely F.E.A.S.T., the homeless shelter that was founded by Martin Li / Mister Negative in the comics. The recent Spider-Man video game featured F.E.A.S.T. in a prominent role, considering that Mister Negative was one of the main villains of the game. In the game, Aunt May actually worked at F.E.A.S.T. and took over the shelter in Martin Li's absence. Perhaps the inclusion of Aunt May working at a homeless shelter is build up for Mister Negative to appear further down the road. Either that, or it's just a really fun Easter Egg to help further establish Aunt May's character. The trailer also featured a number of returning characters from Spider-Man: Homecoming. One of these returning characters was Mr. Delmar, the shop owner that Peter encountered in the beginning of the first movie before his shop was blown up. This is the first time we are seeing Mr. Delmar after the explosion, so it's nice to see not only that he is alive and well, but his shop is back as well. Plus, his cat is still alive, so that's an added bonus. However, despite things looking like they're finally back to normal for Mr. Delmar, the back wall behind his register makes it look like a lot has changed for this business owner. He has a row of photographs and newspapers, all with himself in them. The two newspapers cover the explosion of his shop, with one headline calling his shop the "Top Queens Bodega." There's also a picture of Mr. Delmar with Spider-Man, and another picture of Mr. Delmar with what looks to be Barack Obama. One shot from the trailer features Spider-Man swinging in front of Grand Central Station, with quite a bit of construction behind him. Those who have paid attention to the geography of New York City in the Marvel Cinematic Universe should be able to quickly recognize that the building being rebuilt behind Grand Central is actually Avengers Tower, formerly known as Stark Tower. 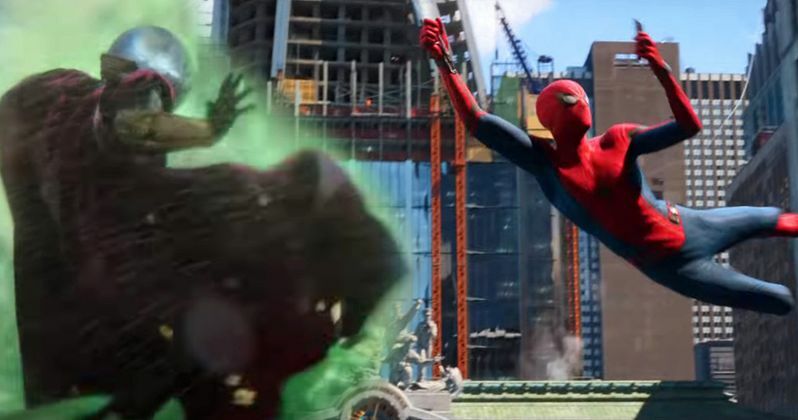 In Spider-Man: Homecoming, it was revealed that Avengers Tower had been sold to an unknown buyer. Now it would seem that whoever bought Avengers Tower did not intend to keep the original, iconic architecture of the building and has either completely torn down the building to start anew or is doing a total redesign of the tower. Whatever the answer to this question is, we may actually have to wait for after Spider-Man: Far From Home to see what is being built, as it looks far from completion in the trailer. Whatever the answer ends up being, it definitely looks like the MCU is setting up something big here. 2 Is Ned Dating Betty Brant? Betty Brant played a very small role in Spider-Man: Homecoming, really only appearing as one of Liz's friends and as an anchor on the school's news station. However, it looks like things are turning around for Betty in Spider-Man: Far From Home, while also turning around for Peter's best friend Ned. Throughout the trailer, there were small moments that hinted that Ned and Betty have started dating, from the two of them cutely taking pictures of each other, to them holding hands as they run away from danger. Only time will tell if this couple will last throughout the franchise. Perhaps, they may become even bigger #RelationshipGoals than Peter and MJ. After the reveal of Mysterio at the end of the trailer, the classic Spider-Man villain was featured on a local news channel in Italy, with a caption that translated to "A Creature Made of Water Emerges From the Grand Canal and Threatens the Entire City - The Man of Mystery Fought with the Creature." The clever part of this is that "mystery" in Italian is "Misterio," which is where Mysterio's name came from in the comics. This was certainly a clever way to introduce Mysterio's name in Spider-Man: Far From Home, and may actually be part of the reason why the movie is set partially in Italy. Surely, Mysterio will be one of the most exciting aspects of the movie, and we are anxious to see if he will remain a hero like he appears in the trailer, or if he will end up becoming a villain like he is in the comics. This first trailer for Spider-Man: Far From Home was filled to the brim with exciting new details, with new locations, characters, costumes, and action. This upcoming sequel from Sony Pictures is panning out to be one of the most anticipated movies of 2019. Hopefully we will learn even more about what to expect from future trailers before Spider-Man: Far From Home hits theaters this July.